By the mid 1980s, AIDS was already a visible problem in Uganda -- scientists now believe this area, in Central Africa's Lake Victoria region, was one of the regions where HIV first began infecting humans. But today, Uganda is widely hailed as Africa's AIDS success story. In 1992 it had a 16 percent rate of infection; by 2003 it had dropped to 4 to 6 percent. The turnaround is largely attributable to top-down leadership by President Yoweri Museveni, who spoke out early and often about the disease, and a homegrown grassroots campaign from ordinary Ugandans to care for the sick and educate the healthy. Museveni became president in 1986 after overthrowing 15 years of dictatorships. He learned of his country's AIDS problem from Cuba's president, Fidel Castro. At the September 1986 meeting of Non-Aligned Heads of State, Castro pulled Museveni aside. "He ... told me that of the 60 soldiers we had sent to Cuba for training, 18 of them had the virus of AIDS," Museveni tells FRONTLINE. "He was therefore worried that it may reflect what [level of prevalence] is in the population." Museveni and his government acted quickly, airing television and radio ads and speaking about HIV/AIDS at political rallies. They developed the now-famous ABC campaign, which stands for Abstain, Be Faithful, or use a Condom. "I could not keep quiet on this," Museveni says. "There was no other option. Any other option would have been murder." As Museveni began leading the government's response, ordinary Ugandans were already confronting the disease. When Noerine Kaleeba sent her husband, Christopher, off to England to get a master's degree in 1985, he was a proud, tall, handsome man. In June of 1986, she got a call from a hospital in England. "Come quickly," the voice on the phone told her. "Your husband is critically ill."
"He told me that my husband had been diagnosed with AIDS," Kaleeba recalls. "My initial reaction was absolute denial. They must have made a mistake because how can my husband who wasn't white, who wasn't homosexual, how could he have AIDS?" When she arrived in England, she was shocked. Christopher weighed half his original body weight, and was so frail he could hardly lift his arm. His body was ravaged by cryptococcal meningitis, a skin rash, thrush and liver problems. Christopher died in January 1987. It was later discovered he'd been infected through a blood transfusion donated by his brother. Kaleeba escaped infection, she says, because she and Christopher were using condoms for birth control. Kaleeba became an AIDS activist. She contacted President Museveni and he put her on the Ugandan government's AIDS response committee. Soon, she founded TASO, The AIDS Support Organization. To this day, it provides care and support for HIV-positive Ugandans and their families, as well prevention and outreach programs, which often involve skits and songs. Other grassroots organizations also emerged in the mid-'80s to help Ugandans care for each other and fight the disease. But Uganda's path forward in the battle is complicated. Intermittent war still ravages the north and in many cases prevents the completion of health surveys and basic health care services. 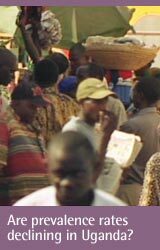 Some experts are questioning the extent of Uganda's success: Recent results of a study done in Rakai, a district in southern Uganda, by the Columbia University School of Public Health, Johns Hopkins University and several Ugandan organizations, suggest that most of the decline in prevalence rates could be due to AIDS deaths. The Rakai study, which has surveyed the same population for the last 10 years, found that there were 70 percent more deaths than new cases in that area annually, but that new infections among young men had increased. The study also found that teenagers were having their first sexual experiences earlier, that people had more sexual partners, and condom use had increased dramatically. And Uganda may be moving away from its famed ABC approach. The government issued a nationwide recall of condoms distributed in health clinics in 2004, due to concerns about their quality. Throughout 2005, the media increasingly reported shortages of condoms across the country, though the government denies the reports. Faith-based organizations and First Lady Janet Museveni, a born-again Christian recently elected to parliament, have come under fire for heavily promoting the A and B parts of ABC, while ignoring condoms. The U.N. Secretary-General's Special Envoy for HIV/AIDS in Africa, Stephen Lewis, accused the U.S. -- which has already given more than $238 million from President Bush's Emergency Plan for AIDS Relief (PEPFAR) and plans to give an additional $170 in fiscal year 2006 -- of jeopardizing Uganda's struggle against AIDS by promoting abstinence and ignoring condoms. "To impose a dogma-drive policy that is fundamentally flawed is doing damage to Africa," he told the United Nationals Integrated Regional Information Networks. Uganda has also been embroiled in international controversy. In August 2005, the Global Fund temporarily suspended five grants worth $367 million after it found evidence of serious mismanagement in the distribution of the money. State Health Minister Mike Mukula was reprimanded by a Ugandan judge and a bank governor for allowing money mismanagement on his watch. The Global Fund's commission of inquiry has interviewed many senior government officials, including many linked closely to President Museveni. Although Uganda's success has been largely attributed to the ABC program, other countries have not had the same success. Botswana has been using the ABC message for years, yet prevalence rates there remain above 35 percent. The secret of Uganda's success may lie in something more complicated, and unique, suggests Helen Epstein, a visiting scholar at Princeton University. In a recent editorial in The Los Angeles Times, Epstein wrote that what made a difference was "something public health experts have no name for. The only way to describe it is a shared sense of humanity, social cohesion, mutual aid and commitment that is impossible to quantify or program." Here, Noerine Kaleeba tells her story and describes the founding of TASO. This page has UNAIDS statistics on HIV/AIDS in Uganda, an epidemiological fact sheet and analysis of the problem. It notes that despite ongoing conflicts that limit access to healthcare, Uganda is a "beacon of hope" for the rest of the world, because of its openness and political commitment to fighting HIV/AIDS. This page is a major AIDS charity and advocacy group's detailed report on Uganda's HIV/AIDS problem. It includes a history of AIDS in Uganda, an explanation of data terms and analysis of the ABC program. The AIDS Support Organization (TASO) continues to provide support for HIV-positive Ugandans and education programs. The Web site includes information on their latest training programs for health care workers, TASO's achievements and "lessons learned." Human Rights Watch issued this 2005 report about the influence of PEPFAR money on HIV/AIDS programs in Uganda. It charges that Uganda is moving away from "scientifically proven and effective strategies" towards abstinence-only education. Although the new approach is "endorsed by some powerful religious and political leaders in Uganda," the report found that "this policy and programmatic shift is nonetheless orchestrated and funded by the United States government."